India: The 17th SAARC and 5th Asian Carrom Championships were concluded in Kolkata, India. Although India lead the score boards in almost every event Men’s Champion Sri Lanka drilled its way for Men’s & Women’s Doubles Event during 17th SAARC Carrom Champion. Although India managed to stay on top during the Asian Championship Sri Lanka gave them a tough time. Sri Lanka’s Chamil Cooray and Single’s Champion Nishantha Fernando secured the Men’s Doubles event beating India’s Yogesh Pardesi/K. Srinivas by 10/25, 25/4 and 25/22 , whereas, Chalani Lakmali and Joseph Roshita of Srilanka beat Rashmi Kumari/S. Illavazaki by 25/15 and 25/14. India secured Mixed Doubles Event, Men’s Team Event and Women’s Team Event by beating Srilanka in all three during the 17th SAARC Championship. India’s K. Srinivas, Yogesh Pardesi and Sandeep Deourkhar beat Srilanka’s Chamil Cooray, Nishantha Fernando and Brindly Wickremasinghe by 2-1 in the Men’s Team Event. Whereas, India’s Rashmi Kumari, S. Illavazhaki and Kavita Somanchi beat Srilanka’s Joseph Roshita, Chalani Lakmali and Yasika Rahubaddha by 3-0 in the Women’s Team Event. During the Mixed Douables India’s Duo Sandeep Deorukhkar/ Kavita Somanchi beat Srilankan Duo Brindly Wickramasinghe/Yasika Rahubaddha by 25/15 and 25/05. During the 5th Asian Carrom Championship, India, Srilanka and Maldives secured 1st, 2nd and 3rd position respectively. 17th SAARC and 5th Asian Carrom Championships were hosted by Carrom Association of Bengal and organized by All India Carrom Federation at The Pride hotel in Kolakta. 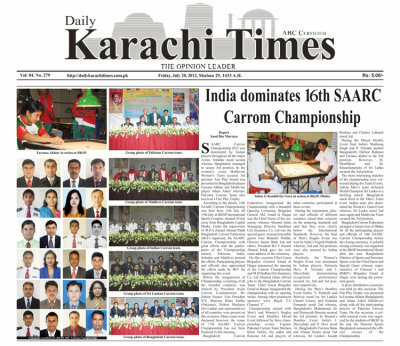 17th SAARC Carrom Championship was played from 5-8th May whereas, 5th Asian Carom Championship was played from 8-11th May. We thank Mr. Murtaza K. Zulfee Secretary General of Pakistan Carrom Federation for sending us the following item published in the Newspaper Human Rights.